When we first arrived in Turkey, we asked a local what Turkish food was. We had just arrived off the ferry from Greece (and were already thinking food.. what else is new?). He shrugged it off like it was nothing special and said his country's food was the exact same thing as the Greek food we'd been eating. He said the two countries have long argued where some dishes like baklava and gyros/doners (Greek/Turkish name) originated from, each claiming them as their own. I believed him and expected more of the same stuff we'd been eating the previous few weeks. 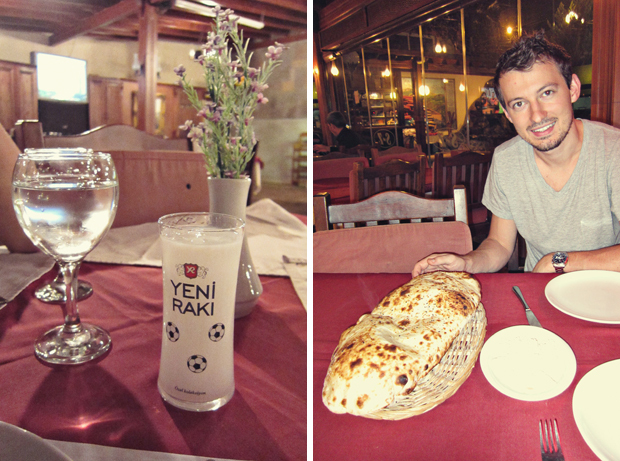 However, we were pleased to find that Turkish food is original and all its own. Almost every restaurant we encountered had kebap on the menu (also known as a shish-kebab in America). Sometimes the meat is strung on a stick in cubes, but usually the meat is ground with a bunch of spices and then grilled on a stick. Some restaurants have as many as 20 different kebap varieties-- imagine how long it took me to pick one the first time around. We quickly fell in love with the Adana kebap because its spicy. The kebap always came on a plate with the traditional Turkish fixings- pide flatbread, rice pilaf with a Middle Eastern kick, a big pile of parsley, onion salad sprinkled with sumac (a common Turkish red spice), grilled tomatoes, and a giant long pepper. One of our other favorites was Turkish pide, their version of pizza. When you hear pizza, you usually think big and round. The Turkish pide, however, is not round. I don't even know what shape it is. Sometimes it looks long, sometimes just irregular. It comes on a plate piled in little pre-cut squares. Usually I like my pizza loaded up with everything, especially veggies. But Turkish pide hits the spot with just ground meat and cheese. The crust alone is to die for. I don't know how they do it. Here and there, some things did remind us of Greek cuisine, like the yogurt served with many meals. Ayran is a yogurt based beverage that we tasted once and never again. Reminded me of drinking sour milk on accident. I preferred the staple Turkish beverage-- tea. This was often served free of charge, both in restaurants and even in some shops. Every single cup of tea we drank (and we drank a lot in 3 weeks time) was in a traditional tulip-shaped glass with no handle. The most common desserts were baklava (always a favorite) and Turkish Delight (or Lokum), which I mentioned in a previous post. It's made of gelatin, water, cornstarch, and sugar with added nuts or dried fruits. 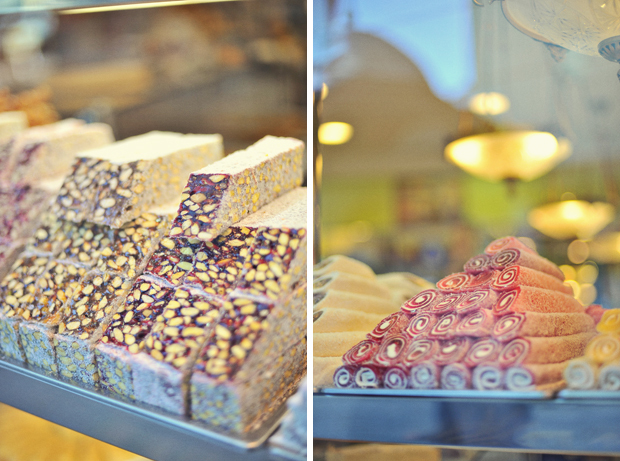 Istanbul has as many window displays piled with Turkish Delight as Paris has with croissants, tarts, and macaroons. Adana Kebap and the traditonal Turkish plate. The first time the waiter brought Lavash to our table, our eyes went wide. The enormous bread was too big to fit on a normal plate. We soon found that the bread is actually very thin and entirely hollow. It is served piping hot out of the oven and slowly deflates like a ballon. It's dusted with sesame seeds and sometimes served with butter/cheese spread. The only reason we tried Raki (or Ouzo in Greece) was because absolutely every table around us was drinking it and we didn't want to miss out. It's an anise-flavored spirit that is distilled with water, and when the two mix, the drink becomes cloudy white. Turns out we weren't missing out on anything.. it tasted exactly like black licorice and although we both took one sip, we couldn't get the dreadful flavor out of our mouth for a hour! A Turkish doner didn't match up to dozens of Greek gyros we had. Honey dipped donut balls off the street. Crispy on the outside and dripping with honey sweetness. A typical Turkish breakfast. We ate this every single morning for 3 weeks. 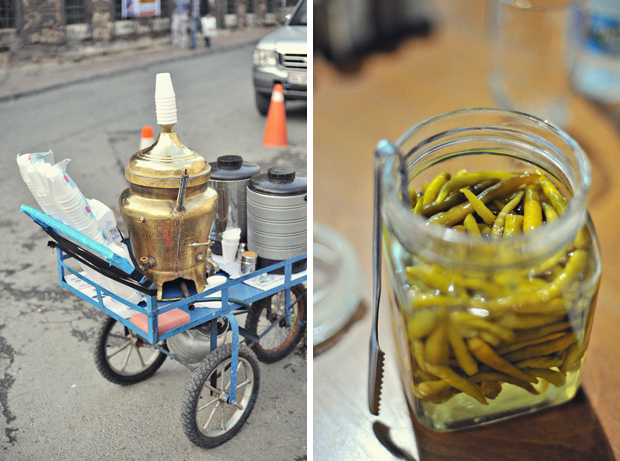 A tasty hot drink, Sahlep, sold on the street. Milk, honey, orchid bud, vanilla, cream, cinnamon, and "special spices". The drink is thick and comforting. I can't imagine how good this would taste on a cold winter day. Chili peppers with EVERYthing. It's a basic staple on the table like salt and pepper. Fried fish sandwiches under the bridge (recommended by one of our readers). Cheap & filling. Must feed sweet tooth anywhere I go. A delicious seafood dinner at Takanik Balik in the historic Arnavutköy neighborhood of Istanbul. As Yuriy loves all things sailing, this place was beyond perfect and bursting with charm. Famous for their seafood soup for good reason-- it was incredible. The free bread bowl had white bread and my childhood fave-- cornbread! 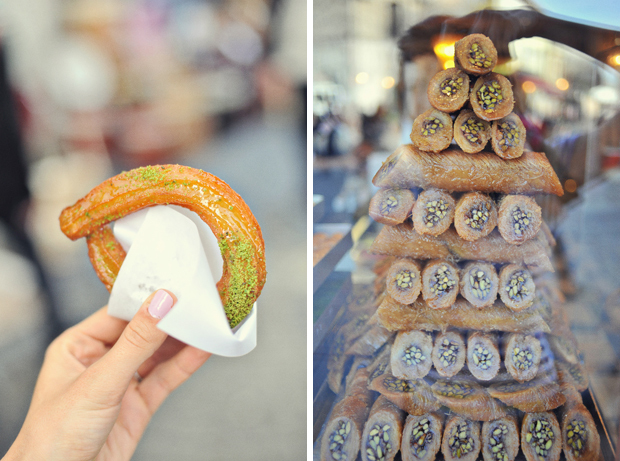 This post wraps up our time in Istanbul. I can't believe how many photos we took there and how long it's taken us to blog it all out! On Monday we start off fresh with photos from our next stop: Budapest, Hungary. That all looks so incredible! mmm yuuuuuummmmmy....thanks to share it!!!!! What a feast, you are certainly embracing the taste sensations of each country. I can almost smell the wafts of fresh lavosh bread. Look forward to seeing what foods have delighted you in Asia. 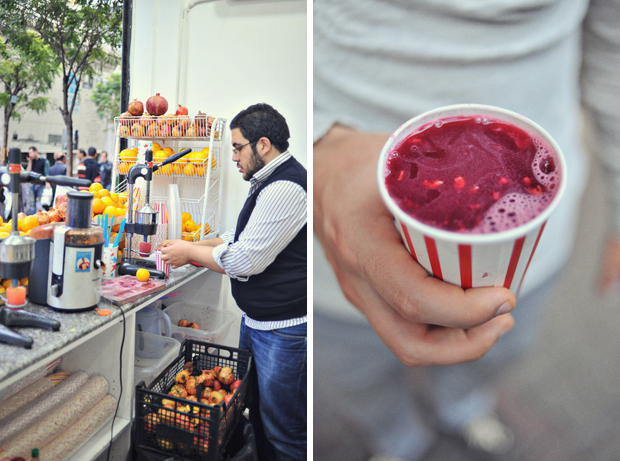 I can almost taste the pomegranate juice and scrumptious looking desserts! Beautiful photos! Has it been difficult communicating in the different countries? What languages do you both speak? I do not know how you two did not just spend all your time eating. Everything looks divinely delicious! epic drool! Everything looks so delish! Oh and Julia, I quoted you on my blog today! Turkish food is out of this world!! I'd love to try it in Turkey instead of Houston! oh man this makes me hungry. Damir is Bosnian - and I'm Algerian so both of our cultures food is hugely influenced by Turkey. There's just something about it that instantly comforts me. I'm always surprised by the great feedback on our food posts because a lot of the photos are taken in dark restaurants and not the best quality. But food is food, I guess. It doesn't need a perfect photo to look yummy. Rationale- Let us know if you find good Turkish food in Seattle. I don't think we've ever been. Flatt 52- Honestly, if you know English, traveling is a breeze because most people around the world know at least a few words in English. If not, then gestures work just fine but its been a long time since we've had to resort to that. We speak English, Russian, & Ukrainian. Out of Space- Actually, we did spend a ton of time eating. There's no denying. Camilla- I can already tell you guys have a lot of good food in your home. Greek and Turkish food is one of my favorite foods. 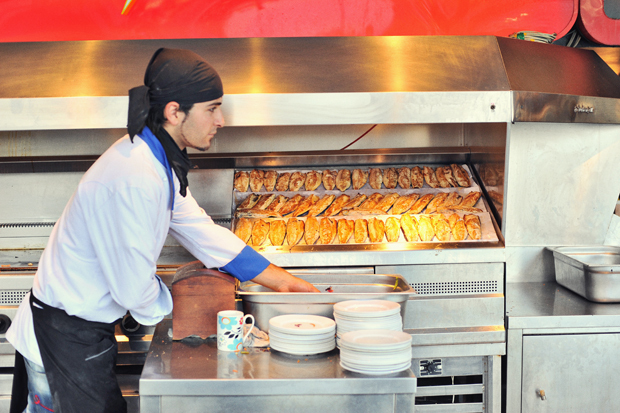 There are many sites those are providing best greek food and turkish food online. You can just go to that site and ordered what you want.